Police have detained at least 331 Turkish soldiers in Tekirdağ province in Turkey’s Marmara region as part of an investigation into the Gülen group, which Turkish authorities blame for a failed coup last year. 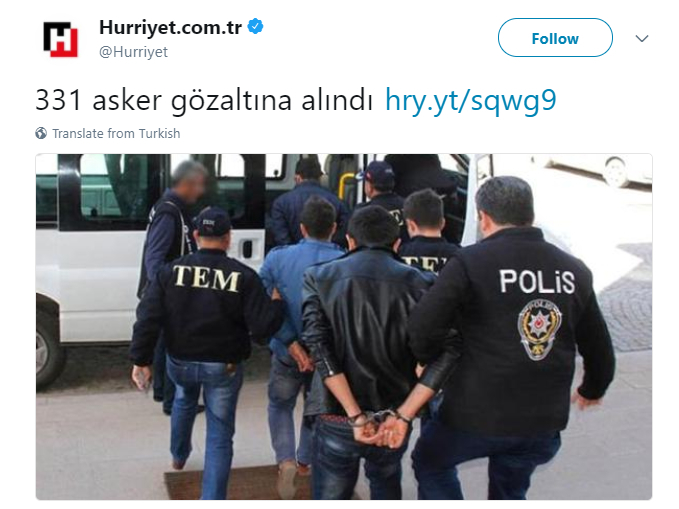 According to the Hürriyet daily, a Tekirdağ court has recently issued detention warrants for 331 soldiers as part of an investigation by the Tekirdağ Chief Public Prosecutor’s Office.Throught the past week, all of the soldiers were detained by Turkish police in raids in different provinces including İzmir, Ankara, İstanbul, Edirne and Tekirdağ. Yet, Erdoğan launched a widespread purge aimed at cleansing sympathizers of the group from within state institutions, dehumanizing its popular figures and putting them in custody. According to a tally by TurkeyPurge.com, nearly 146,000 people, including some 10,000 soldiers, have been dismissed from government jobs, more than 122,000 detained and almost 57,000 arrested over links to the movement.